Orford Ness is a peninsular but is known locally as "the island" and was a local source of employment for many years. There were a number of men employed regularly and there were times when extra labour was needed and some of the unemployed would be engaged. There was a large number of unemployed in the village at this time, in fact the Post Office became the Labour Exchange and it was there the unemployed signed on and drew the unemployment benefit. It was there that employers went when they needed extra labour and engaged some of the unemployed, perhaps for only a few weeks, but then a few weeks work was better than none. The Island was originally used for grazing cattle, the cattle being driven in from the Slaughden end over the Lantern marshes and down to the Kings marshes which lay between the river Ore and Stony Ditch. During the 1914-18 war the government took over the island to use for experimental work because of its remoteness and the Royal Flying Corps moved in. The Kings Marshes were used as an air strip and many experiments were carried out, with aircraft in their infancy there was much pioneer work done at Orford Ness, it was here the first parachute, called the Guardian Angel, was tried, the man chosen as a guinea pig climbed out onto the bottom wing of the biplane hooked the line from the parachute to a hook on the wing and then jumped off between the wing and the tail plane. The first synchronised machine gun to fire through the planes air screw was invented here by a man called Continescue. Night photography was tried and also various bomb sights. Two planes from Orford Ness helped to shoot down a German Zeppelin at Theberton after it had carried out a bombing raid and gained knowledge of aerial combat. I had the pleasure of taking one of the pilots; Captain, later Squadron Leader, Douglas Holder, back to the Island during the 1950s when I heard first hand what it was like during those early days of aviation. Due to lack of accommodation on the Island the Crown and Castle Hotel was used as an Officers Mess and the Town Hall boardroom as the Orderly Room. In the years between the wars the Island was used for many experimental purposes, in 1928 a marine radio beacon was erected about half a mile west of the lighthouse. A wooden building covered by roofing felt housed the radio equipment and a brick building nearby housed the generator supplying the power needed. The building works were carried out by W.C.Reade of Aldeburgh employing local labour one of whom was Mr Charlie Ashley. The radio mechanics manning this beacon worked on shift work to enable the beacon to run twenty four hours a day. The coast guard station situated only about one hundred and fifty yards west of the lighthouse was also manned on a shift work basis, the men living with their families in the coast guard cottages in Quay Street and crossing the river to go on duty at the lookout. There were two families living at the lighthouse and one family living in the marshman’s cottage until the 1930s when marshman, Jack Green, moved to the village and the lighthouse became a Rock station and the families of the lighthouse keepers were withdrawn to live at Harwich. When these families lived on the Island their mail was delivered by the local postman, Mr Burwood who would take his cycle to the Island, being rowed over the river in a rowing boat. The Island was used as a bombing range, not only by day but also night bombing, I remember the Vickers Virginia, an open cockpit, biplane bomber taking off and lying in bed listening to the drone of its two engines as it circled to gain height, wondering and waiting for the bang, knowing it was coming, but nonetheless scared when it did come to rattle all the windows in the house. Of the many types of plane I saw at Orford Ness the most outstanding was a fighter, the Hawker Hart. I laid on my back on the grass in the garden in Crown Lane one day and watched as about eight of them fought a mock dogfight over the village, the pilots dived, banked, sideslipped and did many other manoeuvres I didn’t know the name of for maybe ten to fifteen minutes and I lay enthralled at the aerobatics by those pilots of the day. Tactics which I am sure were to be useful a few years later. It was about this time that two wooden towers appeared on the Island and there was much speculation as to what they were for. One tale which was told was that it was an invisible death ray, another that it could stop the engines of cars. If anyone’s car broke down for no apparent reason the ray was blamed although there was no such thing. The towers were of course used by Robert, later Sir Robert Watson Watt when he was carrying out experiments into the use of radiolocation of aircraft now known as Radar for it was at Orford Ness that radar was first invented before being moved to the higher ground at Bawdsey Manor. Martlesham Heath aerodrome was used for the testing and evaluation of aircraft and many of the prototypes landed on the Island for bombing and gunnery trials and so we saw many different kinds of aircraft, some went on to become world famous others were not seen again. We became quite skilled at recognising an aircraft by its sound before it could be seen, which proved to be beneficial in later years in distinguishing between our own and enemy aircraft. At the outbreak of war the Island was again used as an experimental station, not as an airfield but for gunnery and ammunition trials and aircraft were brought through the village and taken to the Island to be fired at with various guns and ammunition. They were brought on sixty foot long articulated low loaders known as Queen Marys, the fuselage and wing stubs on one and the wings on another. When a Stirling bomber was brought in there was some difficulty in getting it past the Kings Head where the road was very narrow, there being a row of houses opposite at that time with a telegraph pole to complicate it further. We always tried to get something off these planes as a souvenir and on this occasion my brother Jack acquired four large bolts, later he heard that enquiries were being made over the loss of the wing bolts and the police were being brought in. That night after dark, Jack quietly returned the bolts to the quay. German planes were fitted with self sealing petrol tanks and some of the captured ones were taken to the Island and different types of ammunition were tried which would penetrate these tanks and would not allow them to reseal. After firing at one tank for most of one day one of the scientists stood on top of the tank with a 303 rifle and fired into the tank, it exploded and blew him to pieces. One can only hope that something was learned from this. The planes and anything else that went to Orford Ness were loaded at the quay by the crane, which was hand operated, onto a large motor launch, taken to the jetty on the other side and off loaded by another hand operated crane. After the withdrawal from Dunkirk all open land had obstructions placed on them to prevent enemy planes landing if there was an invasion and on the island concrete blocks were made and placed in rows all over the Kings marshes. After the war the island was still used as an experimental station by the Air Ministry and the Ministry of Supply (MoS). Maintenance was carried out by the Ministry of Works and Buildings. To make access and the transport of materials easier, two ex Royal Navy landing craft (LCTs) were obtained by the MoS, a concrete ramp was laid alongside the quay and another one on the island. For the first time vehicles and materials could be ferried across the river without the use of the crane. Bombing trials were continued, radar and cameras being used to track the bombs, rocket firing by aircraft and many other experiments were carried out. 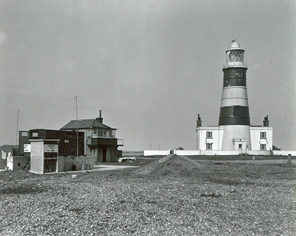 After the East Coast floods of 1953 came a major development on the island, a Bailey bridge was erected over Stony Ditch adjacent to the Trinity House lighthouse bridge, tar macadam roads were laid across the shingle to the old marine beacon where a single storey building was erected and became the telemetry building. Further on the first laboratory with its separate remote control room was built for use by the Atomic Weapons Research Establishment (AWRE). The laboratory was made with six foot thick reinforced concrete walls, shingle banked on the outside and a roof of lightweight alloy, inside a pit, some ten feet deep, housed vibration machines. Trials were carried out by remote control from the control room, also made of reinforced concrete and shingle banked, about two hundred yards away. Over a number of years the road network spread further along the shingle spit and other reinforced laboratories for different types of trials were erected, all for the environmental testing of the trigger mechanisms of the atomic bomb. When this building was going on the MoS were still carrying out trials and also tracking the first Russian sputniks by Radar, but eventually the AWRE took over the whole island and built six laboratories in all, together with remote control rooms and two other bridges across Stony Ditch. A security fence with barbed wire atop enclosed the whole area, which was patrolled by security policemen, some with guard dogs and all of whom were armed during the hours of darkness. Being an outstation of the AWRE headquarters at Aldermaston, Berkshire many of the key personnel were moved to the area, a housing estate being built at Through Duncans, Woodbridge for the scientists who were conveyed to and from the Establishment by bus and a number of houses built in Mundys Lane, Orford for the security police. Many local people obtained good jobs, myself included, at wages which exceeded by far the farm workers wage of the time. The atomic bombs which were exploded in Australia and at Christmas Island contained components which had been environmentally tested at Orford Ness and for a number of years work was carried out over long hours including nights and weekends, but after about twenty years the work load became less and less. In the early 1970s came another major development, Lantern marshes became the site for an American project called Cobra Mist. Roads were made across the marshes using railway sleepers in their thousands which were brought through the village on lorries, sometimes queued the length of quay street waiting to be ferried across the river by a bigger landing craft which AWRE had built and yet a bigger one, Portree, which had been purchased for this project. Eighteen masts, erected in a large semicircle, with an array of aerials sloping to one central point, the cables then returning to a large building which housed all the technical equipment made an impressive display completely at odds with the surrounding area. Said at first to be an Anglo-American radio research station, it eventually turned out to be over-the-horizon radar. Reputed to cost fifty four million pounds to build it ran for only a short time before being shut down and most of it sold for scrap. During the time Cobra Mist was being built, AWRE decided that Orford Ness was no longer needed by them and they moved all the equipment and any personnel who wished to go, back to Aldermaston in 1976.
radio transmitters for the overseas service of the BBC installed in the building and aerials erected on Lantern marshes. In 1993 the National Trust purchased a large part of Orford Ness from the Ministry of Defence for the sum of 3.5 million pounds and the whole spit is now a Grade One site of Special Scientific Interest.